Be enchanted by the beautiful views and divine interior in this serene Lake Superior home. Enchanted Shores is an immaculate, luxury home on Lake Superior`s North Shore. 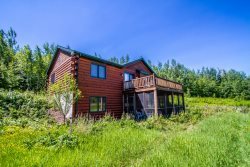 This beautiful home is located on a beautiful stretch of Lake Superior shoreline in Hovland, MN. The home has 3 bedrooms and 2 bathrooms with an additional bunkhouse area with an extra bedroom and 2 more sleeping areas. Enjoy the fire pit overlooking the private section of shoreline. The floor to ceiling picture windows and 2-story stone fireplace are the centerpieces of this gorgeous home. The living room gives you incredible views of Lake Superior under the watchful eye of Maynard the Moose. The open living area is great for families to gather together and enjoy precious vacation time together. Cozy up to the 2-story stone wood burning fireplace on cold winter nights. The kitchen is large and well equipped with everything you need to enjoy preparing meals during your stay. The kitchen is open to the living room, dining room, and game room areas- allowing for a completely open living area. You will love the unique features in the home, including several nature drawing engraved into the countertop. Dine in style while enjoying views of Lake Superior from the home`s dining room. Play a game of pool or darts in the game room. The master bedroom has a queen bed and a sliding glass door leading out to the lake-facing deck. The guest bedroom features two twin beds. The loft area features three twin beds, a small private balcony, and is open to the living room area below. The main guest bathroom has a jetted tub with peek-a-boo Lake Superior views. You will love the towel warmer and separate walk-in shower that rounds out the main guest bathroom. The second guest bathroom is located off of the game room and has a walk-in shower. The second guest bathroom also features a cedar sauna. This home has a large entry room with laundry facilities- great for storing boots and jackets. The bonus bunkhouse has another game room and three additional sleeping areas. The game room in the bunk house has a ping pong and foosball table. The first sleeping area in the bunkhouse is a twin bed located on the landing near the bedroom. The bedroom in the bunkhouse has a queen bed. On the top level of the bunkhouse is the third sleeping area- with plenty of beds and room for everyone The bunkhouse also has a small private balcony that overlooks the main house. The deck of the main home has a gas grill for you to enjoy summer cookouts. Lots of seating to enjoy watching the sun rise over Lake Superior with your morning coffee. Enjoy a meal on the picnic table on the deck. Enchanted Shores is a gorgeous home in a private setting at the end of a long, private road in Hovland. Enjoy this beautiful home, open all year for your next North Shore vacation. The cute little outhouse is located a few feet back from the bunkhouse and great for bunkhouse guests to use if they don`t want to make the walk to the main house. Enjoy this beautiful stretch of enchanting Lake Superior shoreline. Enjoy the sunrise over Lake Superior from your private stretch of shoreline at Enchanted Shores. This immaculate, spacious home has everything you dream of in a Lake Superior vacation home. Enjoy the open floor plan with vaulted ceilings, large picture windows, stone wood burning fireplace complete with Maynard the Philosopher, large wrap around kitchen counter with bar stools, a game room with a pool table, and much more. Melt the stress away in the cedar sauna and pamper yourself in the jetted tub complete with a towel warmer. Gather with family and friends for a game of dartsor stroll out to the bunk house for a game of foosball or ping pong. The main home offers 2 bedrooms, a sleeping loft, and 2 full bathrooms. There is also a bunkhouse with two sleeping lofts and another bedroom that also features a large rec room - perfect for the kids! There is no bathroom in the bunkhouse, but there is a nearby outhouse and guests can always go to the main house just 50 feet away. The home sits on a long stretch of private Lake Superior shoreline and has a beautiful cobblestone and rock beach with easy access from the home. Watch the sunrise, skip rocks, or find a comfy rock and read a book and truly enjoy the majesty that is the Great Lake. On a warm summer evening start a fire in the firepit and roast marshmallows while sharing tales of your North Shore adventures. Hike or ski right out your back door and explore the woods and shoreline of Big Bay. You are located near lots of activities at Enchanted Shores. Head down the shore and just a few miles away you will fine the Judge C.R. Magney State Park and the infamous Devil's Kettle waterfall. Stop by the restaurant at Naniboujou for a full meal or afternoon tea. Or head up the shore just a few miles to the Grand Portage Reservation where you will find the Grand Portage National Monument and the Grand Portage Lodge and Casino, with a full-service restaurant. Take a day trip to Canada or hike Pigeon Falls which runs along the US/Canada border. Whether you choose to explore or choose to relax, serenity awaits you at Enchanted Shores! Pet-friendly - One dog only is allowed with prior approval and agreement to Pet Terms and conditions and an additional fee. I did not have an opportunity to interact with the receptionist at your office, at check in or check out. Both times she was on the phone. But she did smile and acknowledge me when I came in to pick up papers/drop off the key. This place is wonderfully secluded. It is perfect if you want to "get off the grid". We loved how close it was to the lake and how comfortable the house is. The only major bummer is having to hall out the trash all the way to your office location. That is a long way to drive with stinky garbage. Beth was very helpful and great to work with. We enjoyed the property very much. Really lovely setting and the house is beautiful. Loved the seclusion and the fact that there was no wifi or cell phone (truly!). The owners have created a beautiful lake home. Perfect, Very scenic. A great getaway! The staff represents Cascade well. Will not hesitate to use Cascade in the future and refer family and friends! Thanks again for the wonderful experience! I/we enjoyed Enchanted Shores sooooo much! It was welcoming...cozy...and felt so homey! I wished over and over that we could have stayed longer! It fit and met the needs of our family. If I could ever build a home--it would be like that one! I didn't mind being in the kitchen because of the open floor plan--I could be with my family the entire time! We laughed, we talked, we ate, we enjoyed the pool table, everyone took a turn in the whirlpool, the views all around the house were breath taking! It felt like being "outside" no matter what direction we looked! I hope our family with be able to stay at Enchanted Shore again--sometime soon! We thank the owners "for sharing" the beauty and warmth of this truly enchanting home, shore and wilderness! Blessings on you for sharing! Beautiful! Great home. This was a wonderful home with a splash of class, home, nature, and adventure. We loved the decor, amenities, and welcoming nature of the home. For a weekend we lived a dream at Enachanted Shores. Thank you! Awesome home. Our favorite rental yet. We really felt at home. It was perfect for us. Excellent getaway from city life for the family. Spent time hiking and enjoying each others company at the home/cabin overlooking Lake Superior. Home was great, very relaxing and beautiful view of Lake Superior. Easy access to hiking trails and Grand Marais - kids had a blast playing pool, ping pong etc.